Jean-Féry Rebel was a disciple of Lully and went from being a member of the King’s Twenty-Four Violins to conductor of the Royal Academy of Music’s orchestra and one of only two composers to the King’s Chamber. Although a failure when it came to opera – his sole effort, Ulysse, flopped – he had greater success composing several instrumental pieces – what we might call ballets – in which dance was freed from the constraints of sung drama. 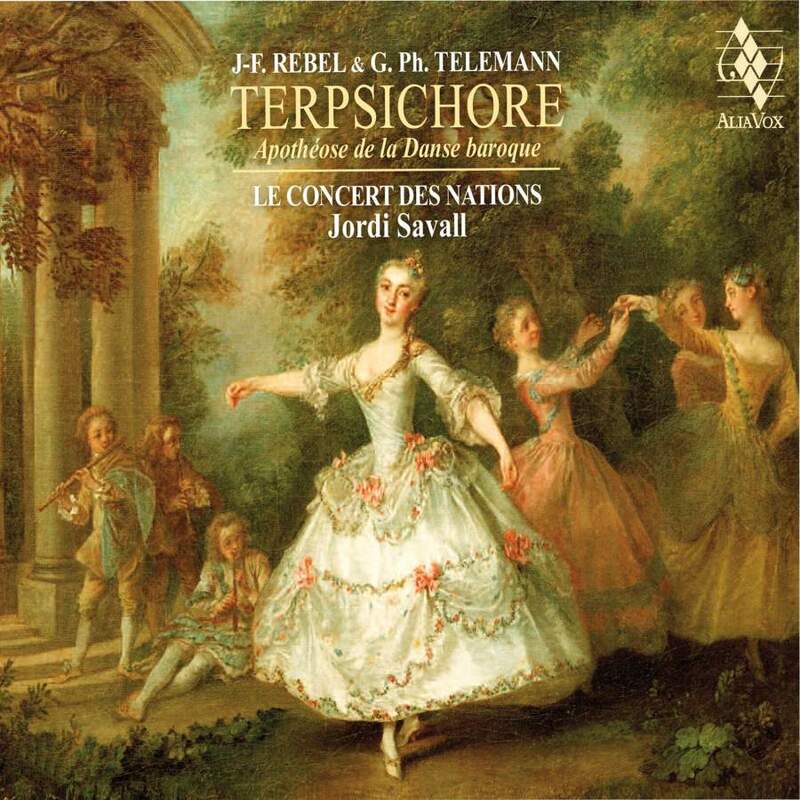 This appealing music forms the bulk of Jordi Savall’s latest disc, along with two suites by his German contemporary Georg Philipp Telemann. The Rebel first, and his ballet suite, La Terpsichore opens the disc with plenty of energy, imaginative harpsichord embellishments (Marco Vitale), immensely graceful strings and ravishing flute (Marc Hantaï, Yi-Fen Chen) playing especially in the delicious Siciliennes and Rondeaus. The spirit of the dance reigns throughout, concluding with a lively English jig. The multi-hued Les Caractères de la Danse that follows has a such a captivating flow, and is here given with such engaging use of percussion (Pedro Estevan), that despite its having been written for the stage you can just picture hooped court ladies and periwigged gentlemen giving it large, beauty spots and all. Throughout, Savall runs each movement into the next as if defying anyone to pause for breath and quit the dancefloor. Les Plaisirs Champêtres is a bucolic delight, from the opening Musette bespangled with Josep Maria Martí’s theorbo, through a toe-tappingly rhythmic Gavotte and shapeshifting Chaconne, to the final pair of bouncy Bourées. The Fantaisie, which concludes Rebel’s contributions, feels almost through composed, ranging far and wide with a pair of thrillingly sprung Chaconnes and the cheekiest Tambourin you are ever likely to hear. If the Telemann feels grander with slightly fewer opportunities for dancers to unlace the stays it is still wonderfully characterful music and receives appropriately majestic performances. The Ouverture-Suite in G (subtitled “La Bizarre”) and the equivalent B Flat suite from his Tafelmusik collection were designed as purely orchestral works, but Telemann’s enthusiasm for all things French ensure that they are constructed in the Gallic manner, their movements essentially a sequence of formal dances. Highlights include the former’s frisky guitar and tambourine led Gavotte and its racy concluding “Rosignol” and the latter’s stately Ouverture, its sparkling Allégresse, its wrong-footed Postillons and chirruping Furioso conclusion. This is hugely stylish playing with Savall’s steady hand on the tiller always remembering that this is dance music at heart, albeit a remarkably elegant form of it. Beautifully recorded, the sound is warmly resonant and yet every instrument can be easily heard within the mix. A thoroughly polite and richly rewarding disc that must rank among Savall’s finest – and that, of course, is saying something. Telemann serves tapas in a rich and entertaining listening experience. Early music pioneer and peace activist accuses ministers of incompetence toward the arts. Standing ovation greets 3000 years of musical history and a moving plea for peace. How did viol guru Jordi Savall find himself attempting to reproduce the 3,000-year old musical history of Jerusalem? Montenegrin guitar star Miloš. Plus the 25 top European summer festivals worth travelling for. Early music royalty rock the recital hall to bring the first week of Sydney Festival’s classical program to a rousing conclusion.